ABOVE: A view of River Countess from a Venice water taxi after a walking tour of the Rialto food markets. INSET BELOW: River Countess at night, the ship's bell on the Sun Deck, and a view of the Venetian Lagoon from Marco Polo Deck. Uniworld's River Countess is a long, flat-bottomed ship of the type that you'd find on the Rhine, the Danube, and other rivers in Western Europe. In 2013, Travel + Leisure ranked River Countess no. 1 among all river and ocean ships in its World's Best Awards, which were based on reader surveys. 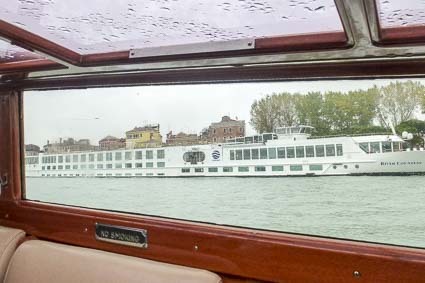 River Countess entered service in 2003, cruised in Germany and Central Europe for more than a decade, and was renovated in 2012 for its new role as Uniworld's ship in Venice and Northern Italy. Marco Polo Deck is the main deck. It includes the reception area, main restaurant, main lounge, and library. Eighteen cabins and four suites are located amidships. The split-level Casanova Deck (aft) and Bellini Deck (forward) are one flight down from reception. Together, they have 34 cabins plus a small lounge, an Internet corner, a fitness corner with sauna, a shop, and a spa. The lowermost passenger deck, Tintoretto Deck, has nine cabins and a self-service laundry. In addition to the enclosed decks, River Countess has a large Sun Deck (reached via inside or outside staircases) with tables, deck chairs, canvas awnings, and a glass-walled pizza restaurant. Accessibility: An elevator serves the Marco Polo, Casanova, Bellini, and Tintoretto Decks, but you'll need to climb stairs if you want to reach the Sun Deck. In its passenger FAQ, Uniworld warns: "River cruise ships are not designed to accommodate wheelchairs or motorized scooters, nor are many older European buildings or historic sites. Guests with mobility issues may be unable to participate in all shore excursions, but are always welcome to relax onboard and enjoy a spa treatment or quiet time with a good book." Our advice: If you use a cane or are adept with a walker, you're likely to do just fine on a River Countess cruise.